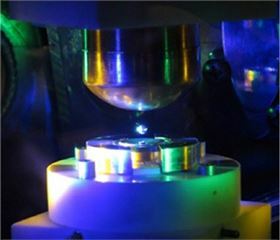 This shows a levitated drop of a metallic liquid inside an instrument used to study the glass transition. Electrodes above and below the sample charge its surface by induction, causing it to rise in the evacuated chamber, hoisted by electrostatic attraction. The sample is melted by laser and then bombarded by an intense beam of X-rays produced by a synchrotron. The pattern in which the X-rays scatter contains information about the positions and interactions of the atoms in the droplet. Photo: Ken Kelton. Glasses are weird ‘solid liquids’ that are cooled so fast their atoms or molecules jam before organizing themselves in the regular patterns of a crystalline solid. So a glass has the mechanical properties of a solid but its atoms or molecules are disorganized, like those in a liquid. One sign of the weirdness of glass is that the transition from liquid to a glass is much fuzzier than the transition from liquid to crystalline solid. In fact, the glass transition is arbitrarily defined as the point where the glass-forming material has a viscosity of 1013 poise. (The viscosity of water at room temperature is about 0.01 poise; a thick oil might have a viscosity of about 1.0 poise.) At this point, the glass is too thick to flow and so meets the practical definition of a solid. Scientists hate definitions this vague, but they've been stuck with this one because nobody really understood the glass transition, which frequently makes it onto lists of the top-10 unsolved problems in physics. For the most part, scientists have only been able to measure bulk properties of glass-forming liquids, such as viscosity and specific heat, and the interpretations they came up with depended in part on the measurements they took. The glass literature is notoriously full of contradictory findings, and workshops about glass are the venue for lively debate. But over the past 15 years, new experimental setups that scatter X-rays or neutrons off the atoms in a droplet of liquid held up by electrostatic attraction (to prevent it from crystallizing) have allowed scientists at long last to measure the atomic properties of the liquid. And that is the level at which they suspect the secrets of the glass transition are hidden. In a new study, Ken Kelton, a professor in arts & sciences at Washington University in St. Louis, and his research team (Chris Pueblo, Washington University and Minhua Sun, Harbin Normal University in China) compared a measure of the interaction of atoms for different glass-forming liquids. Their results, published in a paper in Nature Materials, reconcile several measures of glass formation, a sign that they are on the right track. "We have shown that the concept of ‘fragile’ and ‘strong’ liquids, which was invented to explain why viscosity changes in markedly different ways as a liquid cools, actually goes much deeper than just the viscosity," Kelton said. "It is ultimately related to the repulsion between atoms, which limits their ability to move cooperatively. This is why the distinction between fragile and strong liquids also appears in structural properties, elastic properties and dynamics. They're all just different manifestations of that atomic interaction." This is the first time the connection between viscosity and atomic interactions has been demonstrated experimentally, Kelton said. Intriguingly, his studies and work by others suggest that the glass transition begins at higher temperatures than the conventional glass transition temperature: approximately two times higher for metallic glasses and more than two times higher for silicate glasses such as window glass. It is at that point, Kelton said, the atoms first begin to move cooperatively. Kelton's latest discoveries follow earlier investigations of a characteristic of glass-forming liquids called fragility. To most people, all glasses are fragile, but to physicists some are ‘strong’ and others are ‘fragile’. This distinction was first introduced in 1995 by Austen Angell, a professor of chemistry at Arizona State University, who felt that a new term was needed to capture dramatic differences in the way a liquid's viscosity increases as it approaches the glass transition. The viscosities of some liquids change gradually and smoothly as they approach this transition. But as other liquids are cooled, their viscosity changes very little at first, but then takes off like a rocket as the transition temperature approaches. "It's easier to explain what he meant if you think of a glass becoming a liquid rather than the other way around," Kelton said. "Suppose a glass is heated through the glass transition temperature. If it's a 'strong' system, it 'remembers' the structure it had as a glass – which is more ordered than in a liquid – and that tells you that the structure does not change much through the transition. In contrast, a 'fragile' system quickly 'forgets' its glass structure, which tells you that its structure changes a lot through the transition. "People argued that the change in viscosity had to be related to the structure – through several intermediate concepts, some of which are not well defined," Kelton added. "What we did was hop over these intermediate steps to show directly that fragility was related to structure." In 2014, Kelton and members of his group reported in a paper in Nature Communications the results of some of their experiments on glass transition. These showed that the fragility of a glass-forming liquid is reflected in something called the structure factor, a quantity measured by scattering X-rays off a droplet of liquid that contains information about the position of the atoms in the droplet. "It was just as Angell had suspected," Kelton said. "The rate of atomic ordering in the liquid near the transition temperature determines whether a liquid is 'fragile' or 'strong'." But Kelton wasn't satisfied. Other scientists were finding correlations between the fragility of a liquid and its elastic properties and dynamics, as well as its structure. "There has to be something in common," he thought. "What's the one thing that could underlie all of these things?" The answer, he believed, had to be the changing attraction and repulsion between atoms as they moved closer together, known as the atomic interaction potential. If two atoms are well separated, Kelton explained, there is little interaction between them and the interatomic potential is nearly zero. When they get closer together, they are attracted to one another for a variety of reasons, causing the potential energy to go down, becoming negative (or attractive). But then as they move closer still, the cores of the atoms start to interact, repelling one another. The energy shoots way up. "It's that repulsive part of the potential we were seeing in our experiments," Kelton said. When they measured the repulsive potential of 10 different metallic alloys at the Advanced Photon Source, a beamline at Argonne National Laboratory, they found that ‘strong’ liquids have steeper repulsive potentials than ‘fragile’ ones, and the slope of their repulsive potential changes more rapidly. "What this means," Kelton said, "is that 'strong' liquids order more rapidly at high temperatures than 'fragile' ones. That is the microscopic underpinning of Angell's fragility. "What's interesting," Kelton continued, "is that we see atoms beginning to respond cooperatively – showing awareness of one another – at temperatures approximately double the glass transition temperature and close to the melting temperature. "That's where the glass transition really starts. As the liquid cools more and more, atoms move cooperatively until rafts of cooperation extend from one side of the liquid to the other and the atoms jam. But that point, the conventional glass transition, is only the end point of a continuous process that begins at a much higher temperature." Kelton will soon attend a workshop in Poland where he expects lively discussion of his findings, which contradict those of some of his colleagues. But he is convinced that he has hold of the thread that will lead out of the labyrinth, because different levels of understanding are beginning to line up. "It's exciting that things are coming together so well," he said. This story is adapted from material from Washington University in St. Louis, with editorial changes made by Materials Today. The views expressed in this article do not necessarily represent those of Elsevier. Link to original source. Scientists have discovered that electron anions can reduce the temperature at which mayenite changes from a crystal to a glass. Treating the biopolymer polylactic acid at various temperatures and pressures can induce a new, more robust polymer phase in the material.